Judas' ear shell Ellobium aurisjudae, copyright Ron Yeo. Contains: Siphonarioidea, Hygrophila, Systellommatophora, Stylommatophora, Melampinae, Pythiinae. The Pulmonata are a group of gastropods characterised by modification of the mantle cavity into a vascularised 'pallial lung' allowing direct gas exchange with the air, and the concommitant loss of the gills. As such, the group includes the majority of terrestrial gastropods, forming the clade Eupulmonata. It also includes a number of primarily aquatic lineages commonly grouped as the Basommatophora, though this latter group is of uncertain monophyly. [BV86] Bole, J., & F. Velkovrh. 1986. Mollusca from continental subterranean aquatic habitats. In: Botosaneanu, L. (ed.) Stygofauna Mundi: A Faunistic, Distributional, and Ecological Synthesis of the World Fauna inhabiting Subterranean Waters (including the Marine Interstitial) pp. 177–208. E. J. Brill/Dr. W. Backhuys: Leiden. [BP90] Burch, J. B., & T. A. Pearce. 1990. 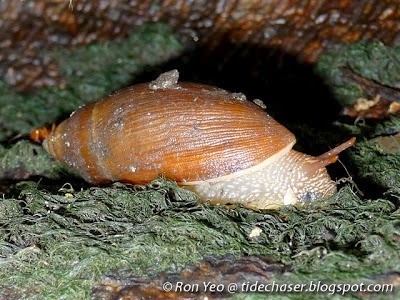 Terrestrial Gastropoda. In: Dindal, D. L. (ed.) Soil Biology Guide pp. 201–309. John Wiley & Sones: New York. [W97] Wells, F. E. 1997. A review of the northern Australian species of the genera Cassidula and Ellobium (Gastropoda: Ellobiidae). In: Hanley, J. R., G. Caswell et al. (eds) Proceedings of the Sixth International Marine Biological Workshop. The marine flora and fauna of Darwin Harbour, Northern Territory, Australia pp. 213–229. Museums and Art Galleries of the Northern Territory and the Australian Marine Sciences Association: Darwin.